Esther McVey | Ipswich Unemployed Action. Bad Week for Esther McVey as she makes more ” false and misleading claims” about Universal Credit. “Praise from across the charity sector” for Universal Credit. Esther had a happy start to her week. Her best friends in the Liverpool Echo continued. Work and Pensions Secretary Esther McVey made a claim about a charity in Parliament – only for the organisation to ‘set the record straight’ with an incredible twitter thread. Ms McVey – from Liverpool – is coming under increasing pressure over the controversial Universal Credit benefits roll-out – which is being blamed by many for pushing more people into poverty. The government says it is making changes to its flagship benefit system in a bid to halt the damaging effects on people. It says claimants will not have to wait as long for their money and debt repayments will be reduced. One of these was mental health charity Mind – and based on its stinging response on twitter, it looks like those at the charity don’t quite agree. It then launched into a powerful thread, which showed the wide-ranging criticisms and warnings it has made about Universal Credit – including since the latest changes were announced. Work and Pensions chief brazenly told MPs that changes to Universal Credit “had received praise from across the charity sector”. The charity Gingerbread, who support single parents, said on Twitter: “We want to be clear – we support changes to the system that benefit single parents, but this statement does not paint the full picture. McVey has become infamous for repeatedly making false and misleading claims in and outside of Parliament. In July 2018 she was forced to apologise to MPs for misleading Parliament about the contents of a National Audit Office report. McVey admitted: “Whilst speaking in Parliament, in answer to questions on the National Audit Office report into Universal Credit, I mistakenly said that the NAO had asked for the rollout of Universal Credit to continue at a faster rate and to be speeded up. “In fact the NAO did not say that Mr Speaker, and I want to apologise to you and the House for inadvertently misleading you. “What I had meant to say was that the NAO had said that there was ‘no practical alternative to continuing with Universal Credit’. GOV.UK Verify programme, now a private “digital identity market” (and essential for Universal Credit) runs into more trouble. Your Identity now part of a “digital” profit making market. In September this news came out. The Government Digital Service (GDS) had submitted a business case for a “reset” of the troubled programme that required extra budget for further development and to pay the external identity providers (IDPs) that underpin the system, but sources say there is little appetite in the Treasury to provide additional funds for a project that is seen to be failing. Three-year contracts with the IDPs are due to end this month. GDS is understood to have spent at least £130m on Verify so far, most or all of which would be written off if the project folds. The IDPs are required to support existing Verify services for 12 months after their contracts end, but sources say further funding would be needed to pay the companies during that period. GDS has not announced any plans for a new procurement exercise to sign up new or additional IDPs. GDS is also understood to be making a case that Verify remains essential to the ongoing roll-out of Universal Credit, the government’s new benefits system. But even there, the Department for Work and Pensions has had to develop an additional identity system after finding that hundreds of thousands of benefits applicants could be unable to register successfully on Verify. I want to update the House on the GOV.UK Verify programme, on the creation of a digital identity market, and the provision of a digital identity service to Government. Since its inception, GOV.UK Verify has sought to create an effective standards based digital identity market in the UK. International examples point to the challenges in successfully creating a secure digital identity framework for the public and private sector. I am proud that the UK is regarded as a global leader in this space, and that the innovative assets and standards created by the GOV.UK Verify programme have been utilised by numerous international Governments. GOV.UK Verify is now sufficiently mature to move to the next phase of its development. The private sector will take responsibility for broadening the usage and application of digital identity in the UK. I can confirm that contracts have been signed with a number of private sector identity providers, for an 18 month period, and with capped expenditure. These commercial arrangements formalise the transition to a private sector led model. The Government has an immediate and growing need for digital identity. As such, I am pleased to confirm that the GOV.UK Verify programme will continue providing a digital identity service to the public sector. Poorly secured services are vulnerable to attack from cyber crime and other hostile activity. 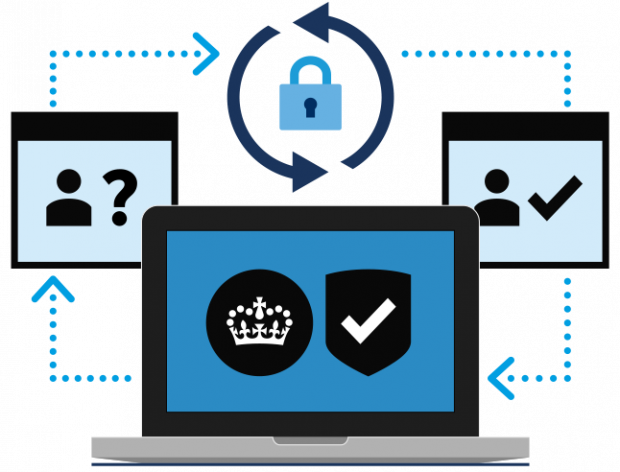 GOV.UK Verify enables citizens to securely prove that they are who they say they are to a high degree of confidence when transacting with Government online. It is a major enabler and a critical dependency for Government’s digital transformation. The Government will continue to provide state backed assurance and standards to ensure there is trust and confidence in the emergent digital identity market. The Government expects that commercial organisations will create and reuse digital identities, and accelerate the creation of an interoperable digital identity market. This is therefore the last investment that the Government will provide to directly support the GOV.UK Verify programme. It will be the responsibility of the private sector to invest to ensure the delivery of this product beyond the above period. The approach announced today ensures that GOV.UK Verify will continue to protect public sector digital services from cyber threats, including identity fraud, and other malicious activity. In addition, the contracts enable the private sector to develop affordable identity assurance services that will meet future private and public sector needs. I am pleased that the Government can continue to support the creation of a digital identity market, and the work of the GOV.UK Verify programme. The standards and guidelines which currently underpin the way Verify works will now be opened up to the private sector to build on. Through these standards and guidelines, GDS and government will ensure there is trust and confidence in the emergent digital identity market. And the private sector will invest to ensure the success of the market, bringing in even more innovation and forward-thinking solutions. While the private sector works on new developments, GOV.UK Verify will continue to protect public-sector digital services from identity fraud and other malicious activity. We’ve signed new contracts with 5 private sector identity providers, who will support Verify over the next 18 months. Users can choose any one of these 5 certified companies to verify their identity online: Barclays, Digidentity, Experian, Post Office and SecureIdentity. People who have Verify accounts with other companies can still use their accounts for the next 12 months, while they set up accounts with the current certified companies. To keep Verify affordable for government, we’re using a tiered pricing system to reduce the cost the government will pay the providers over the 18-month period. As the number of users increases, the cost for government will go down. We are working to get to a position where Verify is cost-neutral for government and sustainable and self-supporting. And we’ve been working hard to ensure the providers we’re working with are, along with the rest of the private sector, empowered to develop commercial solutions that will benefit users and government. This Week Private Eye reveals that the new cash for identity system is already in crisis. The Royal Mail and CitizenSafe have already dropped out. So the 90,000 people registered with them will have to go through the process again. Just to add to the massive problems the on-line application for Universal Credit is already creating. DWP a “fortress” in “denial” about Universal Credit Failures. Universal Credit has again has hit the headlines. Parliamentary committee says department is unresponsive to difficulties people are facing. The committee said McVey’s department has repeatedly been unresponsive to on-the-ground evidence about the practical problems with universal credit, and what it called the “unacceptable hardship” faced by many. The department’s systemic culture of denial and defensiveness in the face of any adverse evidence presented by others is a significant risk to the programme,” the MPs said, citing the DWP’s response to an earlier critical report by the National Audit Office (NAO). Universal credit: delivery causing unacceptable hardship. The introduction of Universal Credit is causing unacceptable hardship and difficulties for many of the claimants it was designed to help. However, while the Department is responsive to feedback on its digital systems from staff, it has persistently dismissed evidence that Universal Credit is causing hardship for claimants and additional burdens for local organisations, and refuses to measure what it does not want to see. In 2013 this Committee raised concerns about the Department’s culture of reporting good news and denying problems that emerge. In further reports in 2015 and 2016 the Committee warned about the Department’s continued lack of transparency. It is hugely regrettable that the Department has not heeded these warnings. Instead of listening to organisations on the frontline supporting claimants, the Department has continued with its fortress mentality and as a result is failing claimants who struggle to adapt to the way Universal Credit works. The recent announcement by the Secretary of State of a further delay and a “slow and measured” approach to the rollout is not a solution on its own and the Secretary of State has admitted that some claimants will be worse off under Universal Credit. If the current problems are not addressed and the funding needed is not forthcoming the hardship is likely to continue. It needs to work with third party organisations to help shape the new programme in light of the real life experiences of recipients. The introduction of Universal Credit is causing unacceptable hardship and difficulties for many of the claimants it was designed to help. However, while the Department is responsive to feedback on its digital systems from staff, it has persistently dismissed evidence that Universal Credit is causing hardship for claimants and additional burdens for local organisations, and refuses to measure what it does not want to see. In 2013 this Committee raised concerns about the Department’s culture of reporting good news and denying problems that emerge. In further reports in 2015 and 2016 the Committee warned about the Department’s continued lack of transparency. It is hugely regrettable that the Department has not heeded these warnings. Instead of listening to organisations on the frontline supporting claimants, the Department has continued with its fortress mentality and as a result is failing claimants who struggle to adapt to the way Universal Credit works. The recent announcement by the SoS of a further delay and a “slow and measured” approach to the rollout is not a solution on its own and the SoS has admitted that some claimants will be worse off under UC. If the current problems are not addressed and the funding needed is not forthcoming the hardship is likely to continue. The Department needs to work with third party organisations to help shape the new programme in light of the real life experiences of recipients. “This report provides further damning evidence of a culture of indifference at DWP – a Department disturbingly adrift from the real-world problems of the people it is there to support. Its apparent determination to turn a deaf ear to the concerns of claimants, frontline organisations and Parliament is of real concern. The culture needs to change. A Department in denial cannot learn from its mistakes and take the action necessary to address the desperate hardship suffered by many Universal Credit claimants. DWP’s dismissive attitude points to a troubling pattern of behaviour in the Department – something highlighted by our recent report on errors in Employment and Support Allowance. The Department’s painfully slow approach to correcting underpayments, years after it accepted responsibility, indicated weaknesses at the highest levels of management. As a priority the Department must demonstrate a tangible shift in the way it listens and responds to feedback and evidence. Meanwhile, the Government’s recent announcement of changes to the roll-out of Universal Credit offers no guarantee that the problems facing claimants will be resolved. Alok Sharma insists jobcentre staff and claimants are happy with benefits overhaul. Speaking on BBC Radio 4’s Today programme, Sharma insisted the message he was getting from jobcentre staff and claimants was that they were much happier with universal credit. However, he refused to be drawn when it was put to him that a report by a charity that runs a network of more than 400 food banks had found they were four times as busy in areas where the full universal credit service had been in place for 12 months or more. The Trussell Trust recorded an average 52% increase in the number of three-day emergency food packages distributed. Prompted to answer three times, Sharma said another report by MPs had suggested there were “very many reasons” why people used food banks and they could not be attributed to just one factor. Sharma, who rejected claims that his boss, Esther McVey, had been ducking out of media appearances, and said he was responsible for the government’s increasingly beleaguered benefits policy, claimed it was working because “cliff edges” that had previously disincentivised people from working had been removed. The DWP’s own survey found 40% of people were experiencing financial difficulties eight or nine months into their claim, and McVey, the work and pensions secretary, recently admitted the rollout would leave “some people worse off”. The new benefit Universal Credit is rolling out to millions, and many could find themselves caught in a gap over Christmas. Here’s how to avoid being caught out. Universal Credit is rolling out to about 100,000 people a month, leaving a trail of rent debt and food banks in its wake. The six-in-one benefit is meant to make welfare easier and fairer, but it’s been bundled up with cuts that MPs warn cause “unacceptable hardship”. The Department for Work and Pensions (DWP) has been blasted for being “in denial” about the problems by Parliament’s public spending watchdog. Meanwhile Christmas is fast approaching – and thousands of families face the risk of a financial gap over the holiday season. That’s because there is a standard five-week wait for your first payment when you start claiming Universal Credit. But there is a way to avoid being high and dry, and not everyone is affected. So how do you know if you’re hit, and what action should you take? Here’s a guide. See also this important article by Kitty S Jones. Esther McVey Defends Universal Credit, Hell or High Water! The Right Honourable Esther McVey: My door is always open. Yesterday in the House of Commons Esther McVey was on rare form. Bertie Wooster once recommended that when confronted with a misdeed the best response was stout denial. Readers of Hansard and no doubt those who watch the BBC Parliamentary Channel can see her Ladyship following his sage advice. That an humble Address be presented to Her Majesty, That she will be graciously pleased to give directions that the following papers be laid before Parliament: any briefing papers or analysis provided to the Secretary of State for Work and Pensions since 8 January 2018 on the impact of the roll-out of universal credit on recipients’ and household income and on benefits debts. Universal credit, the Government’s flagship social security programme, has been beset by flaws in its design and delivery. It is causing immense hardship for many people wherever it is rolled out. It is hard to believe now, but universal credit was designed to lift people out of poverty and smooth the transition into work to ensure that it always pays. 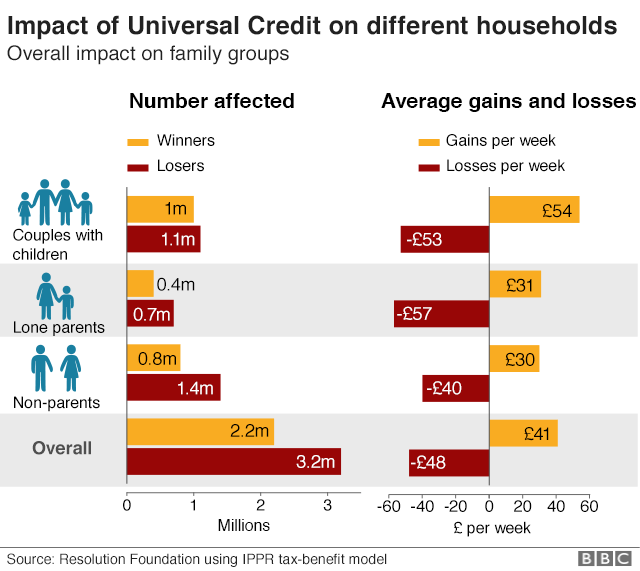 The reality is that universal credit is a vehicle for cuts: cuts in support for families with a disabled child for whom the basic rate of support is half what it is in tax credits; cuts in support for disabled people in work, such as the disabled person who wrote to us saying that they are more than £300 a month worse off since switching from claiming working tax credits; and cuts in support for lone parents bringing up children who will get more than £20 a week less on average, with many losing far more. Let me make some progress. Overall, 3.2 million families with children could lose around £50 a week. People are worried, but there is no clarity from Government. The Prime Minister told this House that no one would be worse off, yet The Times reported that the Secretary of State told Cabinet colleagues that households could lose up to £200 a month. Being forced to manage on a low income that is then cut still further means tough choices for the families affected. The DWP’s own survey of claimants published in June showed that nearly half of new universal credit claimants are falling behind with bills. Even six months later, four in 10 are still struggling to cope financially. And so it went. And went – it’s pretty long so I skip. Members want to speak in this debate. I know too, Mr Speaker, that you are always anxious to hear Back Benchers speak, as am I, so I will keep my remarks as brief as possible. I have been forthright with colleagues across the House—and in my speech at Reform earlier this year—about universal credit’s strong merits and the areas that we need to improve. In fact, in my Reform speech, I said that I would improve universal support, and I delivered on that this month. Since becoming Secretary of State, I have changed the system to provide extra support for those with severe disabilities, vulnerable young 18 to 21-year-olds and kinship carers. I am also working with colleagues to identify areas where we can make more improvements. We have taken a mature approach to rolling out universal credit. We have said that we will test, learn, adapt and change as we go forward. That has resulted in a series of improvements, and I will read some of those out. We are providing extra universal support with Citizens Advice, an independent and trusted partner. We have brought in the landlord portal. We have brought in alternative payment arrangements, 100% advances and housing running costs. We have removed waiting days and are providing extra support for kinship carers and those receiving the severe disability premium. My door is always open. We will make sure we get this benefit right, and Government Back Benchers, who have genuine concerns, want to get it right. After a heated four-hour debate, they voted by 299 to 279 against the release of the documents, which Labour hoped would reveal the detrimental effect of the welfare shake-up which rolls six existing benefits into a single payment. Labour used an arcane parliamentary procedure known as a humble address – previously used to force the release of the Government’s Brexit impact assessment – to try to compel the publication of analysis of the shake-up on people’s incomes. Work and Pensions Secretary Esther McVey last week admitted that some people “could be worse off” under the reform, despite Theresa May’s claim that would not be the case. Ms McVey’s opposite number, Margaret Greenwood, today called for the Government to publish all reports and analysis it has carried out into the effects of Universal Credit since Ms McVey took office in January. “The social security system should be there for any of us should we need it, yet the Government’s flagship programme has brought real hardship,” she said. “How did it come to this in the fifth largest economy in the world that we have people facing hunger and destitution? Ms McVey yesterday confirmed that the “migration” of existing welfare claimants to Universal Credit would be delayed until later in 2019. Meanwhile the BBC reported that the deadline for full implementation could be pushed back by another nine months to December 2023. The @DWP Employment & Support Allowance error first occurred in 2011. It took them 6 years before they acknowledged the mistake. Now nearly 200,000 ill & disabled people are owed almost £1 BILLION in back-payments.